The Houston Oilers had a 4-4 record as they hosted the Detroit Lions on November 5, 1989. 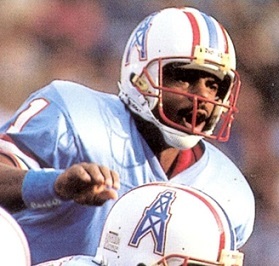 The Oilers were a talented team, most notably on offense where QB Warren Moon (pictured above) was a formidable passer in the team’s version of the run-and-shoot. However, under Head Coach Jerry Glanville, they were also prone to undisciplined play and inconsistency. Detroit also operated a run-and-shoot offense, but Head Coach Wayne Fontes’ club was struggling at 1-7. Rookie RB Barry Sanders was having an impact but the passing game had yet to click. The Lions were also leading the league in turnovers with 30 thus far. There were 48,056 fans in attendance at the Astrodome. The Lions had the first possession and drove 83 yards in nine plays as rookie QB Rodney Peete started off with a completion to WR Robert Clark for 47 yards to the Houston 36. From there it was Barry Sanders carrying on almost every play until diving into the end zone from a yard out for a touchdown. Ed Murray added the extra point for the 7-0 lead. Houston responded with a 10-play, 75-yard series. Facing third-and-four, Warren Moon threw to WR Ernest Givins on a crossing pattern to pick up 32 yards to the Detroit 37 and, three plays later, RB Mike Rozier converted a fourth-and-one situation with a run for the necessary yard. A pass interference penalty in the end zone set up RB Lorenzo White’s one-yard carry for a TD and Tony Zendejas added the game-tying point after. As the game headed into the second quarter, the Oilers again had the ball in Detroit territory. But after reaching the 32, Moon fumbled when hit by SS Bennie Blades and LB Chris Spielman recovered for the Lions, with his 19-yard return giving them possession at the Houston 49. Eight plays later, a scrambling Peete passed to Clark for a 16-yard touchdown, Murray converted, and the visitors were back in front by 14-7. The Oilers came back with a long drive of 89 yards in 15 plays. Moon completed six passes along the way, with tosses to WR Haywood Jeffires for 25 yards and WR Drew Hill (pictured at right) for 18. Another throw to Hill for six yards converted a fourth-and-one situation and a personal foul on the Oilers on a third down play gave the home team first-and-goal at the Detroit six. Rozier ran the last yard for a TD, Zendejas added the extra point, and the score was again knotted at 14-14. With the time down to less than three minutes to go in the first half, the Lions put together an eight-play, 60-yard possession. Peete connected with WR Walter Stanley for 18 yards and Clark for 25 as Detroit advanced into scoring territory, and Murray kicked a 47-yard field goal to put the visitors ahead by 17-14 at halftime. On the first play from scrimmage of the third quarter, Rozier fumbled and, after Detroit DE Kevin Brooks grabbed the ball in the air but also couldn’t maintain possession, FS William White picked it up and ran 20 yards for a touchdown. Murray’s point after put the Lions further ahead at 24-14. Now down by ten points and following a 28-yard kickoff return by DB Kenny Johnson to the Houston 43, the Oilers drove 57 yards in seven plays. Six of them were pass completions by Moon, the longest to Hill for 25 yards and the last to Givins in the back of the end zone for a six-yard TD. Zendejas converted to again make it a three-point contest. After a punt by the Lions, Houston had another scoring drive, advancing 78 yards in ten plays. Detroit’s defense still couldn’t stop Moon’s passes, including the last one to Hill for a seven-yard touchdown. Zendejas added the extra point and the home team was in front, 28-24. The Lions had the ball as the game entered the fourth quarter and punted, but immediately got the ball back when Moon’s throw down the middle was intercepted by LB Jimmy Williams. Two plays later Peete connected with Clark for a 22-yard gain to the Houston 18, but the receiver fumbled and LB Eric Fairs recovered for the Oilers. The home team proceeded to put together a long 18-play, 87-yard drive that ran more than ten minutes off the clock. Moon finished it off with a run this time, carrying for a two-yard TD, and Zendejas converted. With 3:15 left to play, Detroit fought back with an eight-play, 69-yard possession that was kept going when a Peete completion to Clark gained 19 yards in a fourth-and-nine situation. The series concluded with Sanders running 14 yards for a TD on a draw play. Murray kicked the point after and it was a four-point contest, although with the time remaining down to 1:41. It appeared that the Oilers would be able to run out the clock, but the Lions got a break when, after catching a third down pass, Givins fumbled and CB Terry Taylor recovered and ran 35 yards to give Detroit the ball at midfield. But any chance of the visitors pulling out a dramatic win ended three plays later when a sideline pass by Peete was deflected and picked off by a leaping DB Tracey Eaton with 56 seconds to go. Houston won by a final score of 35-31. The Oilers led in total yards (455 to 351), first downs (30 to 19), and time of possession (39:39 to 20:21). Houston never punted but turned the ball over four times, to two by the Lions, and was penalized 10 times at a cost of 85 yards, to seven flags for 50 yards thrown on Detroit. 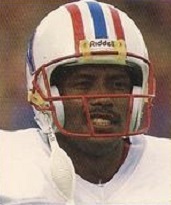 Warren Moon completed 30 of 38 passes for 345 yards and two touchdowns while giving up one interception. He also ran the ball 8 times for 22 yards and a TD. Drew Hill topped the Houston receivers with 9 catches for 101 yards and a touchdown. Ernest Givins and WR Curtis Duncan had six pass receptions apiece, for 77 and 66 yards, respectively, and Givins had a score. RB Allen Pinkett led the runners with 40 yards on 8 attempts. 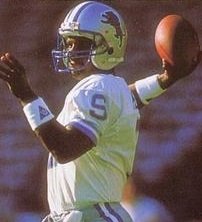 For the Lions, Rodney Peete (pictured at left) was successful on 18 of 29 throws for 273 yards and a TD while being intercepted once. Robert Clark grabbed 6 passes for 141 yards and a touchdown and WR Richard Johnson contributed 6 receptions for 77 yards. Barry Sanders rushed for 91 yards on 19 carries that included two TDs. The Oilers surged to four wins in their next five games, but tailed off badly at the end and finished with a 9-7 record that placed second in the AFC Central and qualified for a Wild Card playoff slot. They lost to Pittsburgh in the first round. Detroit caught fire following the close loss to Houston, winning six of their last seven and ending up with a respectable 7-9 tally that ranked third in the NFC Central.